The Mobridge area has a wonderfully diverse retail industry for a small town, and this year the Mobridge Area Chamber partnered with local retailers to take part in nationwide Small Business Saturday festivities. Many local businesses offered great deals on their merchandise that day and gave out cloth tote bags with the Shop Small logo on them in appreciation for their customers. Director Haden Merkel stuffs Shop Small bags with local deals Saturday morning. 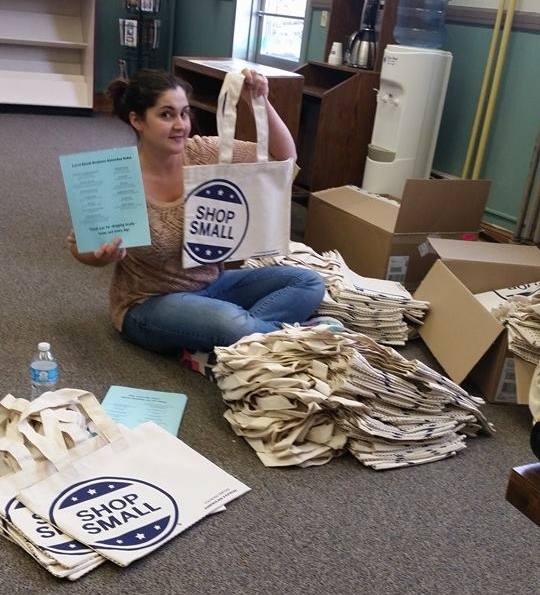 The Chamber received cloth tote bags, signage for the event (shown in this promotional video for the event), and more materials aimed at raising awareness about the benefits of shopping small. Materials were provided free of charge from American Express and shipped free by FedEx, national Small Business Saturday partners. For information on how your business can get involved in Small Business Saturday and other retail promotions in the Mobridge area, please email haden@mobridge.org or call 605-845-2500.